Fall is here and that means carving pumpkins, raking leaves, chilly nights, and of course, back to school. The kids are another year older and it seems like another foot taller! Can we just slow down time a little bit? At Green Jeans Creative we’re super excited about one company in particular that’s helping parents capture these seasons of life with their kiddos. storieChild is for parents who don’t have the time to print, glue, and organize their child’s’ memories. We became involved with storieChild because we know what it’s like not to have enough time to save memories in a scrapbook or picture album. If your baby books are anything like ours, they’re halfway done with the pictures and memories quickly fading. With storieChild, you have all the resources you need to make your memories last forever in only 10-25 minutes. 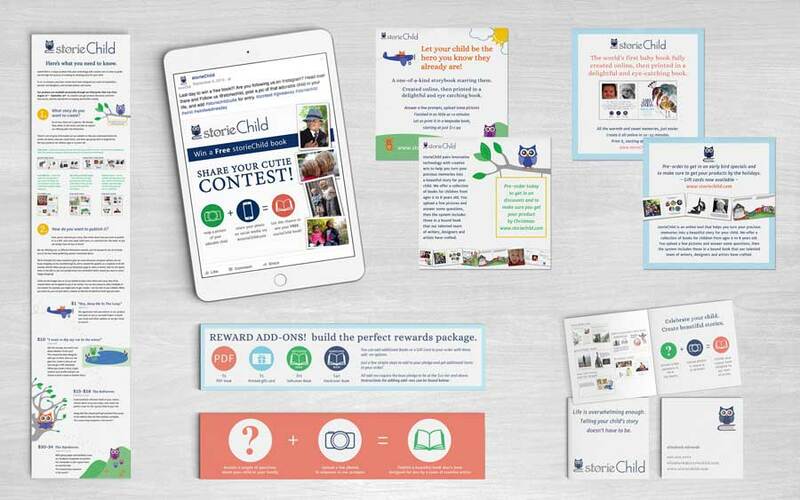 storieChild helps you create one-of-a-kind storybooks to share with your friends and family. Our Green Jeans Creative team is helping storieChild with their marketing strategy to promote their launch. We’re creating marketing materials like infographics, web graphics, social media promotions, business cards, and posters. We love helping companies like storieChild that have little to no branding identity or design to develop and share their unique story. Green Jeans Creative works with clients of all sizes and backgrounds to connect them with their audience by using the latest design and marketing strategies in cost-effective ways. Whether you have a marketing team or just created your first marketing budget, we are here to help you share your story with the right audience.